Editor’s note: This is cross-posted from the Oracle WebCenter (@oraclewebcenter) blog for posterity. Stay tuned to that channel for more stories about social at Oracle. Peter’s (@peterreiser) tribute to SunSpace has inspired me to tell the story of Oracle Connect, Oracle’s internal social application. Social enterprise is all rage now, and this trend has grown out of the runaway success of consumer services like Twitter and Facebook. People logically believe that social tools can help them at work–shrinking geographical distances, providing a place to share insight and information, fostering a sense of community–basically all the same benefits consumer networks provide. People do work, after all, so why not focus on the people, rather than on emails, documents, transactions, and all the other artifacts of work. Turns out this is true, not without some effort and caveats, but at the core, true. July 2007: IdeaFactory is born. Like many technology-loving companies, Oracle saw the social trend early, and in July 2007, a small team focused on innovation within Oracle development, AppsLab (@theappslab), turned on the IdeaFactory, a Rails application built in less than 24-hours, to capture product ideas and allow user-voting on ideas. The IdeaFactory lived inside the Oracle firewall and was only promoted to a handful of teams within Oracle Applications development. Its stated goal was to collect product ideas, specifically for Oracle Applications products. However, the IdeaFactory went viral, and people from all over Oracle logged in, voted, commented and contributed their own ideas, and not just about Oracle products, but also about internal topics and practices. From the beginning, one key goal the AppsLab had was to make everything public, and because the IdeaFactory used corporate LDAP, there was no anonymity. Everything was out in the open, which fostered open and honest communication. 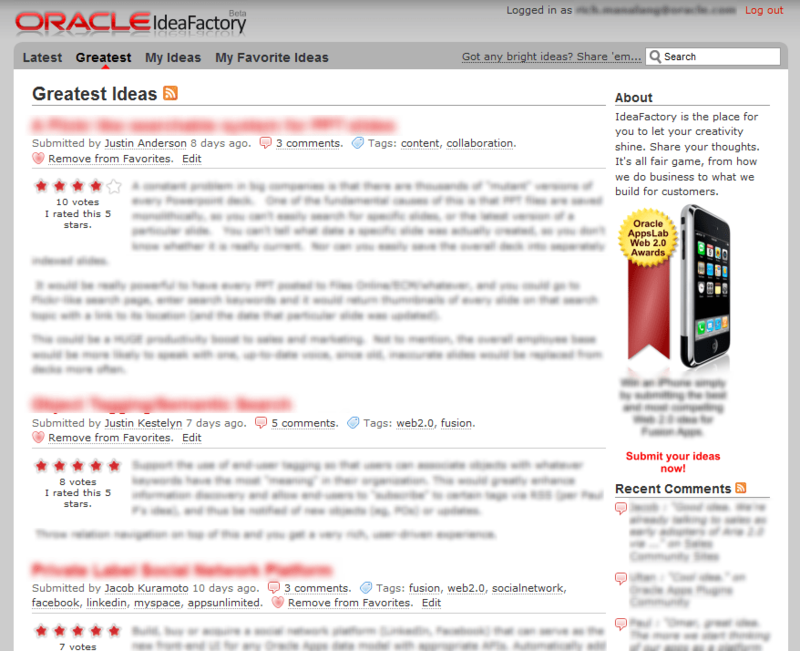 August 2007: IdeaFactory becomes Oracle Connect. The IdeaFactory quickly grew beyond its original goals into something more, and in August 2007, the AppsLab team added a social networking layer, creating Oracle’s first social tool, Oracle Connect. Connect used the corporate LDAP server, so every Oracle employee had an account and a base profile, no account creation required. The networking was bi-directional, i.e. request-approve, and anyone could ask to connect with anyone else, even the CEO, which several people did. As with IdeaFactory, very little promotion went into Oracle Connect, and yet after less than a month, more than 14,000 Oracle employees had tried it. The AppsLab team followed up quickly with a beta release that included many new features, including an activity log, enhanced profile and better search. These features were meant to solve real problems for Oracle employees. By 2007, Oracle had significantly increased its pace of acquisitions, and as members of acquired companies, several of the AppsLab team were keenly aware of the challenges that people new to Oracle encountered, like finding basic information (e.g. about benefits, corporate policy, mailing list signups, etc. ), deciphering what someone actually did beyond a title, discovering who does what and how to reach people, getting answers to basic questions and even thanking people for their help. Among its innovative features, Oracle Connect included a new take on the org chart, called the management bar, which added a breadcrumb-style listing of a person’s management chain to her/his profile. A simple hover showed all the people at that level. This innovation was picked up by other web applications within Oracle and rolled forward into new product. Connect also aimed to foster and facilitate internal innovation within Oracle, so in conjunction with Connect, the AppsLab launched OpenLab, an open source-style project that welcomed any internal developers to grab Connect’s code and add features that met their needs or scratched an itch. This gave enterprising developers a chance to learn the latest web technologies and a sandbox to test and hone their skills; it also provided a way for pent up innovation to bubble up and reach a wider audience. Oracle Connect was a success internally, and people began to notice. 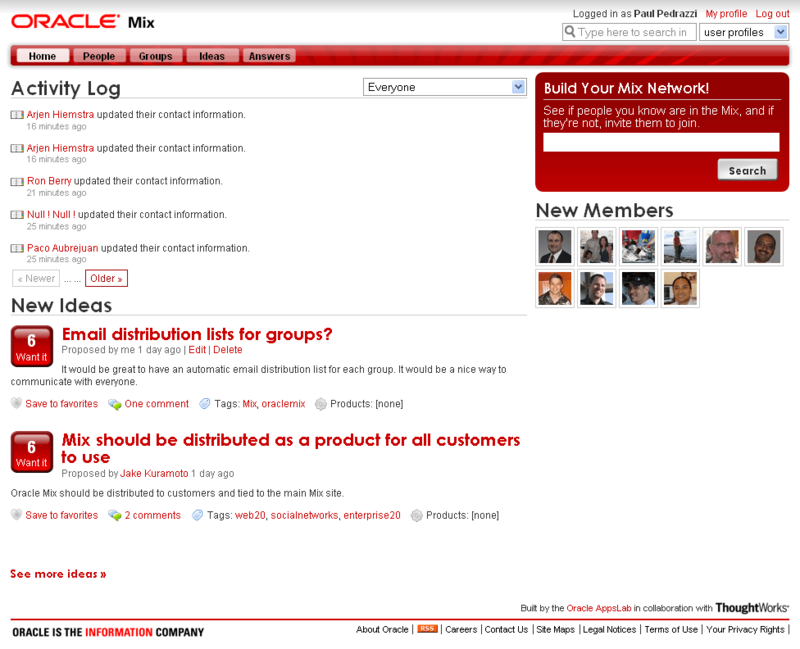 November 2007: Welcome to Oracle Mix. The success of Oracle Connect and of social within Oracle caught the attention of Oracle’s CMO, Judith Sim. She wanted to extend the conversation beyond Oracle employees to include anyone interested in Oracle. 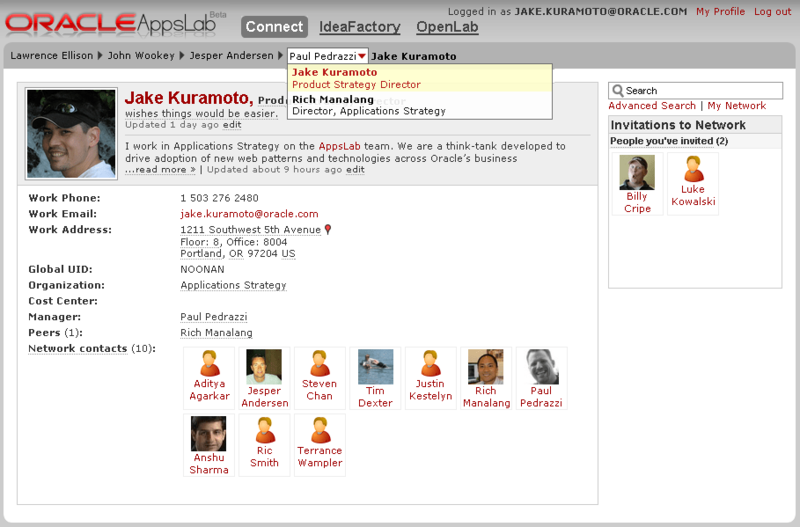 So, after a whirlwind design and build, the AppsLab team launched Oracle Mix at Open World in November 2007. 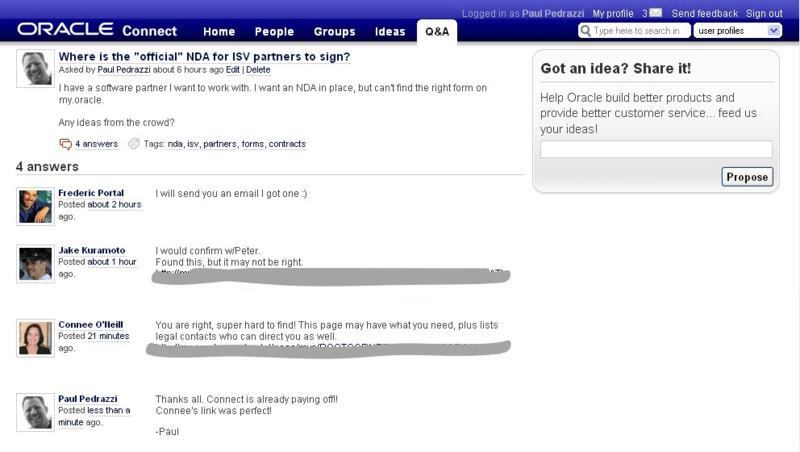 Oracle Mix allowed anyone to sign up, create a profile, add ideas, ask questions and join groups. Although the target audience was primarily Oracle users, anyone could register and participate in the community. Interesting side note, at the time, Oracle Mix was the largest publicly-deployed application built with JRuby on Rails, a Java implementation of Ruby, and Mix shares the spotlight with many consumer Ruby on Rails applications on the official home for the Rails language. Oracle Mix continues to serve as the network for the Oracle community at-large to this day, and since its launch, Mix has hosted several initiatives like Suggest-a-Session for OpenWorld, which debuted for OpenWorld 2008 and has been renewed each year since. After launching Mix, the AppsLab team turned its attention back to Oracle Connect. Oracle Connect had grown virally, serving several thousand users on a daily basis, despite having nothing other than word of mouth to promote it, and the more it was used, the more useful it became, as people added helpful content, answered questions, tweaked ideas and generally reaped the benefits of the weak ties in their corporate networks. In June 2008, Connect 2.0 released, migrating all existed data to the new JRuby codeline used by Oracle Mix, adding groups and questions, along with a product taxonomy to go along with the tags that Connect already supported. This second version also included REST APIs for Connect’s data, a big plus in a large enterprise environment with many different systems and applications, managed by different teams. These APIs were publicly available inside the firewall, and several developers used them to take advantage of Connect’s growing popularity, helping spawn two other wildly successful side projects. In January 2009, the third version of Oracle Connect launched. Connect 3.0 added new post types and addressed a noise problem that had developed as a side effect of growing popularity by introducing canned filters to help people find the most relevant information. Connect 3.0 also included lightweight integration with another rapidly growing and popular, homegrown social tool, OraTweet, the side project of Noel Portugal (@noelportugal). Each service used the other’s REST APIs to create and share data; integration like this happens much more easily inside a corporate firewall than out on the consumer web. And speaking of the consumer web, Google had launched OpenSocial in late 2007, and by 2009, the spec was maturing rapidly and many consumer social sites were implementing OpenSocial to create instant networks around their content and integrate with other social properties. In 2008, the AppsLab team began experimenting with the reference implementation of OpenSocial, Shindig, and by early 2009, they had a working sandbox that internal developers could use to access Connect data via OpenSocial. Realizing that OpenSocial could add huge benefits inside an enterprise, providing a standard and open way to socialize intranet properties and loosely tie data together across many disperate sites, the AppsLab presented its initial findings at OpenWorld 2008 in an unconference session. Oracle, through the AppsLab, was an early proponent of OpenSocial in the enterprise, and at Google IO 2009, Google’s annual developer conference, Rich Manalang (@rmanalan) was invited to show what Oracle had done with OpenSocial and Oracle Connect. As social ramped up in 2008 and 2009, so did mobile. After the launch of the iPhone App Store and the iPhone SDK, Clayton Donley (@cdonley) combined several internal services, including Connect, into the Oracle People app for iPhone, another side project, and the first iPhone app Oracle employees could use to access data stored inside the corporate firewall. In May 2009, Oracle Connect 4.0 was released, including a host of new features targeted at focusing the experience on people, making publishing dead simple, loosely integrating other services and systems, producing standard and open data for consumption and creating an independent group experience. This was a huge update to Connect, which had grown exponentially, serving as many pageviews weekly in 2009, as it had monthly in 2008. Much of the increase in traffic came from a social initiative started in EMEA that was using Connect as its primary social tool. In September 2009, the AppsLab team joined WebCenter development to apply their social learnings and experience to WebCenter, Oracle’s emerging social tool. Oracle Connect became a side project, and the AppsLab team put it into maintenance mode, i.e. keep the lights on and only fix critical bugs. However, even though Connect’s codeline would not advance, the team brought all their ideas and product plans to WebCenter, where social was being embraced and spun into real product, to help real customers. Connect continues to run today, still supported by the remaining members of the AppsLab team, who now belong to a new team of WebCenter evangelists. 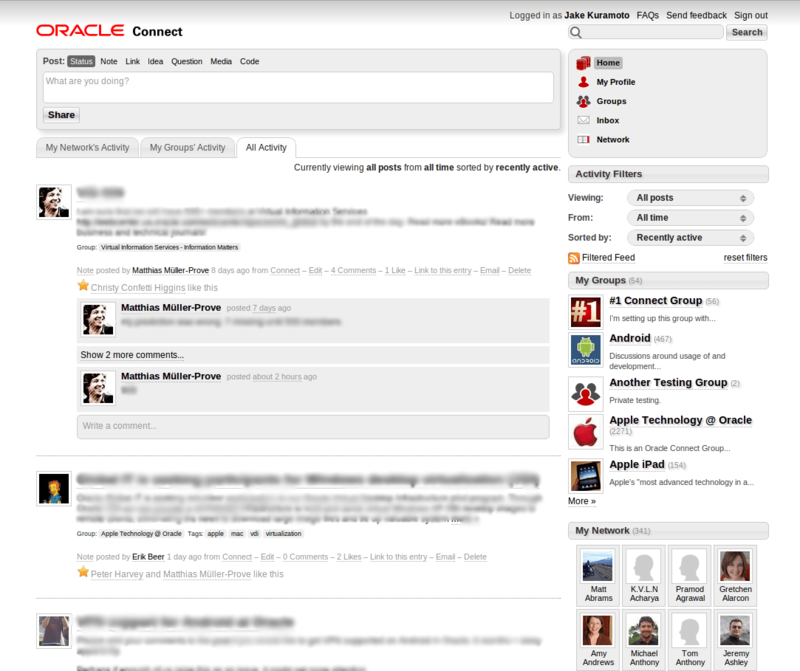 Connect is used extensively by Oracle employees, each day, and despite having no enhancements since May 2009, it still garners favorable feedback from new users. Traffic to Connect peaked right after the Sun merger in 2010, when it served several hundred thousand pageviews each month; since then, traffic has subsided, but still averages tens of thousands of pageviews to several thousand users each month. What began as a little experiment with new technology has grown into a mission-critical social tool, used by thousands of people each day to get work done. Thanks for the history lesson Jake. Great stuff! Keep it all going. I’ve read and heard bits and pieces from you over the years, nice to see it in writing. Much easier to point people to now. Oh yeah, it’s impressive too. Thanks for writing this, Jake. I often refer to it to remember what I did back in 2007 or to prove to my current colleagues that we were into enterprise social before Yammer, SocialCast, Jive, and Chatter. Sure, it’s been a long time and always nice to refresh the memory. Connect is still chugging along, not nearly as active as it once was, but it’s still a viable social tool.